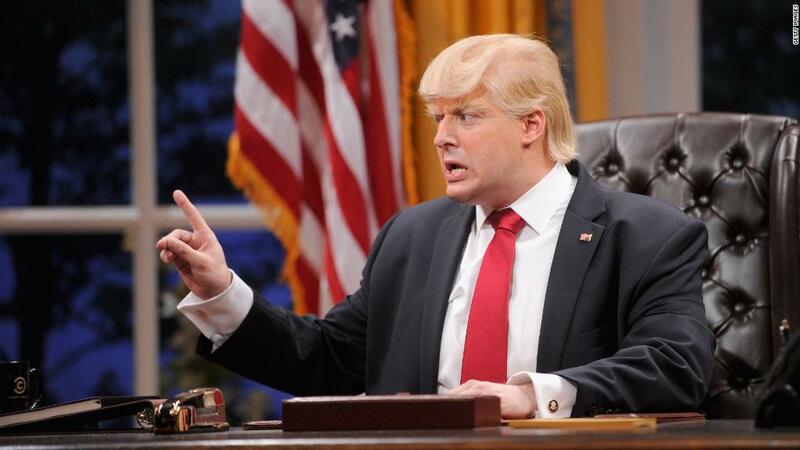 Donald Trump was one of 17 candidates in the GOP primaries when actor Anthony Atamanuik did his first impersonation of him during an improv show at Upright Citizens Brigade in New York. “He announced on my birthday, on June 15, and I thought it was pretty silly at the time,” Atamanuik recalled. Lots of reporters and commentators felt the same way. “But by August, I was like, ‘Well, this guy’s for real.’ And I thought it would be funny to do him,” the comedian said. Atamanuik’s stock right rose along with Trump’s. This year the comedian turned the Trump performance into a full-time gig, starring in 20 episodes of “The President Show” for Comedy Central. “It takes two hours to get into the makeup,” he said in an interview with CNN. The first season garnered “yuuuuge” praise and strong ratings for Comedy Central. Later this month Atamanuik and the producers are taping a Christmas special to wrap up the year. It remains to be seen if Comedy Central will order a second season. Hear more from Atamunuik on the CNN Special Report “Late Night in the Age of Trump,” Monday at 9 p.m. on CNN. “In the world that I live in, long-form improv, the idea is commitment. You want to commit fully,” he said. Atamunuik makes a lot of observations — “that guy literally has zero introspection or inner thought” — for someone who has never actually met the president. He emphasized, though, that his comedy is “not about just taking apart Trump.” There is an empathetic layer to his version of Trump.